I have never been a fan of typical Irish American foods. Shepherd's pie, corned beef and cabbage and even Guinness leave me curling my lip in disgust. Perhaps this is due to the fact that Val dislikes them and never cooked these dishes at home. In spite of this, everyone we know who happens to be Irish deems it lucky that Val's birthday falls on St. Patrick's day. Alas, to bring her out to a restaurant meal on her special day would always mean that Irish/American fare was the only thing featured on every menu in the few dining establishments that were open in March on beautiful (and open only for the season) Cape Cod. The smells of boiling meat and vegetables permeated the air, taking root in her winter coat and hair. Even after the disappointment of her birthday meal, she could never get away from it without hanging her coat on the line for the March wind to air it out. That isn't to say that Val is by any means anti-Irish. On the contrary, she loves to learn of all things Gaelic and if offered to live out another life, she would likely choose being a peasant woman on a remote farm in the lush, rolling green fields of The Emerald Isle, tending to her old milking cow, a few pigs and bountiful garden. In the evening, retiring by the fire with a hot cup of cocoa and a warm, fresh slice of soda bread with butter and her cat curling up by her side. She is intrigued by Irish heritage, history and poetry. She just doesn't like the stereo-typical dinner menu as filtered through the years in the good old USA. But there is one Irish recipe that made it's way across the Atlantic which still remains today to be truly delightful. I'm sure it has been toyed with and adapted by different families over time but for me, Irish Soda Bread has never lost it's charm. It's much like southern biscuits, but formed into a loaf and enjoyed sliced rather than portioned with a cutter before being baked. Who can argue with flour, sugar, and butter? No one. Not even Val. 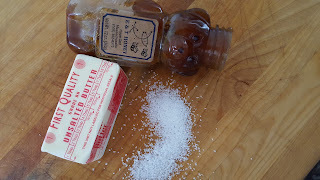 In fact, she is the reason why I love any combination including those 3 ingredients so much so that I write about my obsession consistently on this blog. 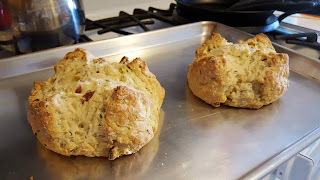 So, in honor of Val and all things Irish on St. Patrick's day, I am baking a batch of soda bread. Happy birthday, Mom. May you have the "Luck of the Irish" and many treats on your special day. 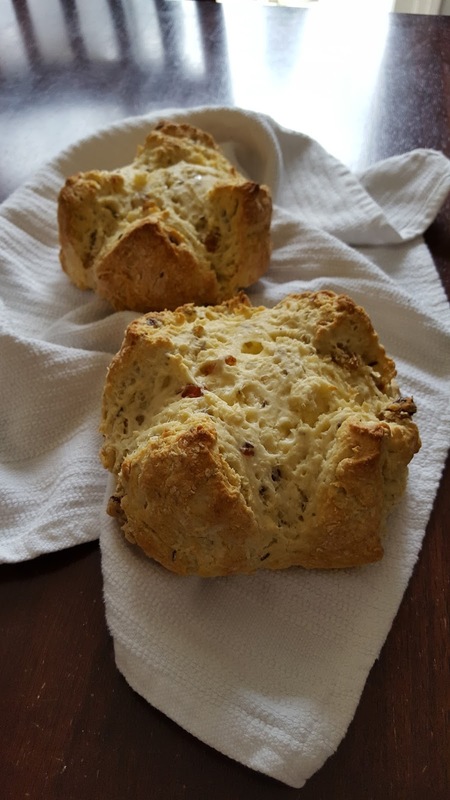 Just recently, I learned that soda bread with caraway seeds and the addition of raisins and currents (or both) was traditionally made for St. Patrick's day. I say, make it anytime because it is so easy and delicious. Whisk together 4 cups of flour, sugar, salt and baking soda in a large mixing bowl. Using pastry cutter (or two knives), work butter into flour mixture until it resembles coarse meal, then stir in raisins and caraway seeds. Make a well in the center of the flour mixture. Add beaten egg and buttermilk and stir together until dough becomes stiff. Lightly flour hands and gently knead dough in the bowl just enough to form a rough ball. Do not over knead or handle dough to much. Transfer dough onto a lightly floured board and divide into 4 equally sized pieces. Form each into a round loaf. Transfer loaves to a lightly greased cookie sheet. Using a serrated knife, score the top of each loaf about an inch deep in an "x" shape. Transfer loaves to oven and bake until bread is golden and bottom sounds hollow, about 20-25 minutes. Also, check for doneness by inserting a long thin skewer. If it comes out clean, the loaves are done. Remove to wire racks and allow to cool before slicing. Delicious the next day too, as toast with butter. Mix together butter, honey and salt. Transfer to a ramekin and refrigerate until ready to use. Spread it on toast, crackers or whatever vehicle you like.